Do I Need Paint Booth MakeUp Air? What the heck is it? Since we have announced the arrival of the Sure-Cure AMU to the market, we have been getting a lot of questions from customers about what an Air Makeup Unit does, why it is needed and how it works. Here are the simple answers to all of those questions. We’ll try not to make it too complicated, because it’s really simple…. It provides lots of air to the paint booth. Now, why would anyone need all that extra air? Well, it’s not really ‘extra’ air, it’s replacement – or makeup – air for air that has been used and expelled out of the booth. Booth exhaust systems use up large volumes of air from the space that it is installed. If this air is not replaced at the same rate that it is expelled, the booth, or the building, will experience negative pressure (the air pressure outside the building is greater than the air pressure inside the building). Why is negative pressure bad? At the risk of sounding like a bunch of engineers, some indicators of negative pressure include the suction pressure that makes booth doors difficult to open, exhaust fans that don’t work properly, drafts around doors and windows that cause a poor paint job and poor indoor air quality. What does this have to do with your painting? Pressure problems make it difficult to paint in a booth and achieve proper coating and curing. When you are able to control the booth pressure and temperature, you are able to effectively remove particulates from the air that can negatively affect the quality of your finish. These problems are more pronounced during the cold season when windows are kept closed, reducing the natural pressure-balancing effect. When you have an air make-up system, like the Sure-Cure AMU, the unit replaces the air that is expelled by a building’s exhaust system, maintaining the proper balance between inside and outside air pressures. 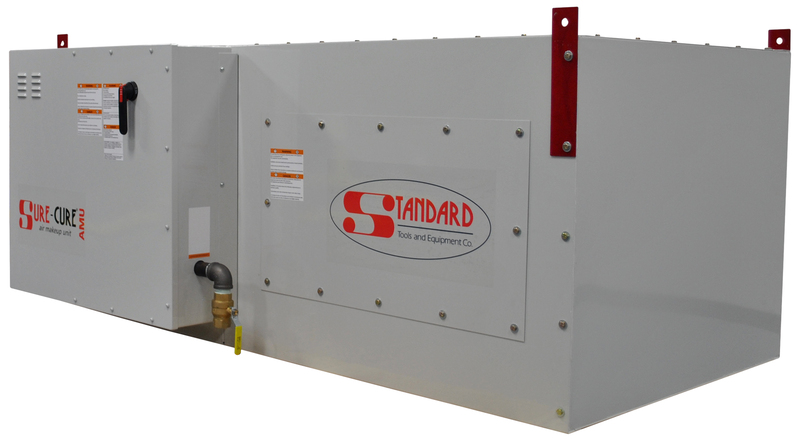 Replacement air can be heated in the winter months or to improve curing time. You can choose to not heat the replacement air in warmer months. There are many individual benefits and features that differentiate AMU models and makes. It’s in our Sure-Cure air makeup unit features that make our unit safer and easier to operate. Now that you know why you need an AMU, check out all the benefits of having our AMU. Want to see the video that launched it all? See the Sure-Cure AMU, in action, from all angles in just 55 seconds! Previous Previous post: Let’s Chat ….. Online! Next Next post: Should you replace your Air Makeup Unit? Things to consider.